In San Francisco, this past weekend, the tenth annual Hardly Strictly Bluegrass Festival took place and, for the second straight year we had a friend visit from far away - in this case, I was able to return the hospitality that my friend Marializ Maldonado had been extending to me ever since my first visit to Chile, three decades ago. Marializ, in fact, did not come to California specifically to attend the festival, but took advantage of a visit to Tennessee - where her Nashville-based son Miguel Cancino plays lead guitar for singer Natalie Stovall’s touring band - to visit us in the Bay Area. It might seem odd to find a Chilean to play in a country band but, in a sense, it gave me another reason to persuade Marializ - a journalist who has interviewed Mexican Norteño bands such as Los Tigres del Norte - to come visit us for a few days. Last year, when friends from the blustery Falkland Islands visited us, we found it difficult to persuade them that the autumn weather in Golden Gate Park could be cool, foggy and windy enough to require warmer clothing. This year, though, it was not hard to convince someone who knows the Chilean coastal cities of Valparaíso and Viña del Mar - climatic analogues to San Francisco - that the weather can get damp and chilly in coastal California. The fact that it was so did not deter us from enjoying acts like Richard Thompson, the Flatlanders, and Robert Earl Keen on Saturday. 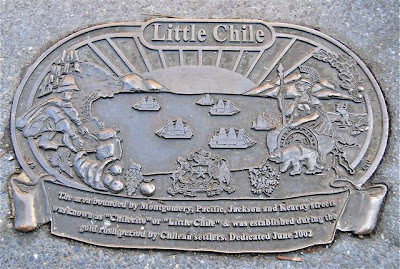 I have written several times about the connections between California and Chile and, as we spent Sunday and Monday touring the East Bay and San Francisco, the topic was never far from the surface. In Berkeley, for instance, we drove past the Latin American community center La Peña, founded in the aftermath of 1973’s brutal coup by Chile’s General Augusto Pinochet, and its Café Valparaíso, which serves a largely Chilean menu. Many people are unaware that Chileans played a huge role in the California Gold Rush, even though the popular California-based novelist Isabel Allende portrayed that period vividly in her Daughter of Fortune. 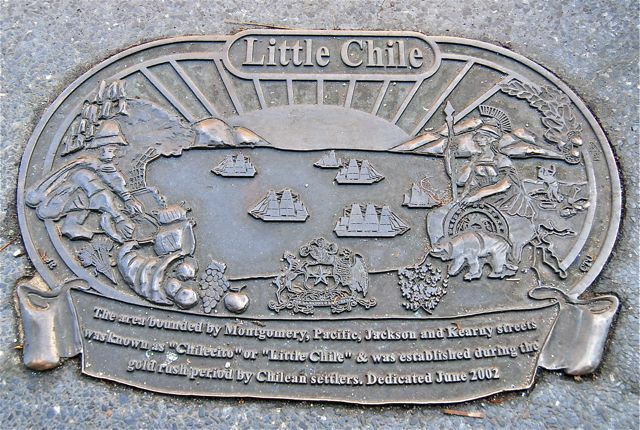 Some 7,000 Chileans resided in the San Francisco neighborhood then known as Chilecito (“Little Chile”), in and around the intersection of Columbus Avenue and Kearny Street. It took us some time but, with the help of the Honduran host Conrado Henríquez of Café Vesuvio, we found the sidewalk plaque (pictured at top) placed there by the Chilean consulate in 2003 - that’s because it’s small and inconspicuous, especially in the shadow of Francis Ford Coppola’s Café Zoetrope, in the historic Sentinel Building (it would be no surprise if the building owed its distinctive copper façade to Chilean metals) . 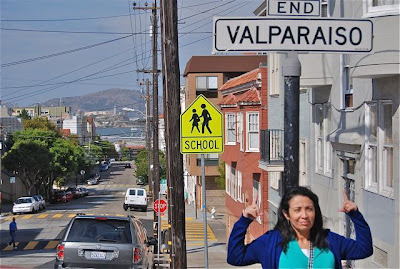 With his help, we also learned something I had never known - at the foot of Russian Hill, on Jones between Greenwich and Filbert, San Francisco has its own Valparaíso Street, a mid-block alleyway that bears the name of Chile’s UNESCO World Heritage Site. By way of reciprocity, of sorts, Valparaíso has plenty of places named San Francisco - including, unfortunately, the landmark namesake church that suffered serious damage in last February’s earthquake. Meanwhile, I was surprised to learn, through Buenos Aires Herald columnist Nicolás Meyer, that the Argentines also played a brief but literally noteworthy role in early California history. 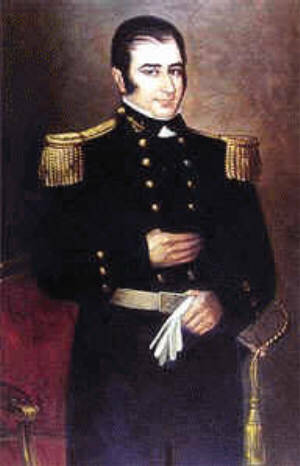 It’s a complex tale but, in 1818, the temperamental privateer Hipólito Bouchard (a Frenchman who had studied in the United States but gained Argentine nationality during the wars of independence) overran the Presidio of Monterey - California was then part of the Viceroyalty of New Spain - and raised the Argentine flag there. In Spain’s view, Bouchard was a pirate and, in any event, his rule lasted only five days before he continued south to Chile. En route, he raided a coastal ranch, landed in Santa Barbara and occupied San Juan Capistrano (where his reputation as a pirate survives) before continuing to South America - where Chilean admiral Thomas Cochrane (a Scotsman who created Chile’s navy) dispossessed him of his ships and weapons in Valparaíso. 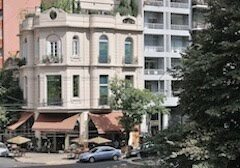 This, of course, could make a good tale for Coppola - who owns property in Buenos Aires and has filmed there - to take to the screen.